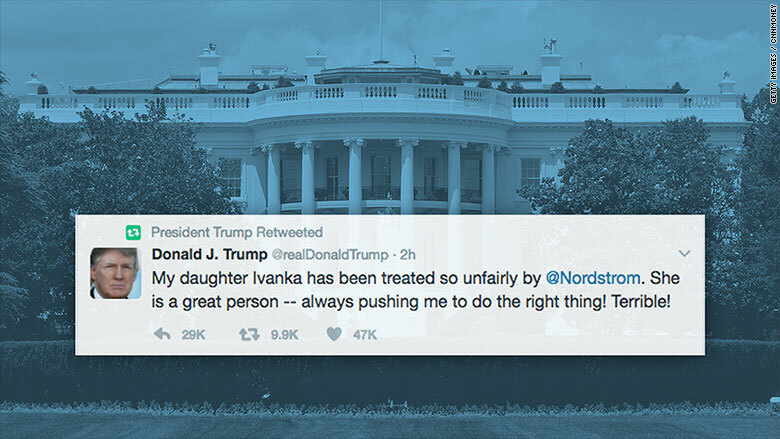 President Trump tweeted a jab at Nordstrom department stores from his personal account Wednesday morning, which was then retweeted by the official @POTUS account. @POTUS, the official Twitter account for the president, had so far been reserved for government issues. The Trump tweet blasted Nordstrom for treating his daughter Ivanka "so unfairly" by discontinuing her fashion line. Nordstrom announced last week that it would no longer carry Ivanka Trump's line of clothing and accessories. The president went on Twitter to defend his daughter -- who is also a close White House adviser. Press Secretary Sean Spicer defended the president's use of the @POTUS handle to discuss his daughter's business. "This was less about his family's business and an attack on his daughter," Spicer said. "For someone to take out their concern with his policies on a family member of his is not acceptable and a president has every right as a father to stand up for them," he said. Nordstrom responded Wednesday by repeating that the decision to drop Ivanka Trump items was "based on performance." "Over the past year, and particularly in the last half of 2016, sales of the brand have steadily declined to the point where it didn't make good business sense for us to continue with the line for now," the company said. "We've had a great relationship with the Ivanka Trump team. We've had open conversations with them over the past year to share what we've seen and Ivanka was personally informed of our decision in early January," Nordstrom said. Jordan Libowitz, communications director for Citizens for Responsibility and Ethics in Washington, said Trump's actions are a shocking departure from the presidential norm. "This is absolutely unprecedented. You really don't see a president using his office to attack an American business, but certainly not for the beneift of his family's business," Libowitz said. Norm Eisen, the former White House ethics chief under President Obama, called Trump's actions "outrageous" and urged Nordstrom to "consider suing." Actor and filmmaker Ron Howard said the tweet "trivializes the office and suggest he prioritizes family enterprise & monetary gain." Writer and Director Ava DuVernay called Trump a "#Crook." Some Trump supporters rallied around him, tweeting support for the president and promising to #BoycottNordstrom. Ivanka Trump's fashion line, known simply as Ivanka Trump, is not part of her father's company. 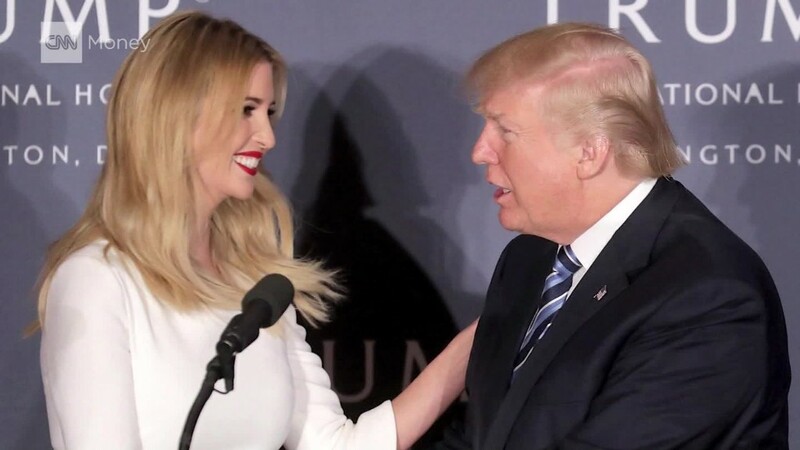 And she went further than her father to divest from her business holdings by selling her common stock and converting her equity in the Trump Organization into fixed payments. She's currently on a leave of absence from the Ivanka Trump brand and the Trump Organization, promising she will "no longer be involved with the management or operations of either company." CNNMoney's Jill Disis contributed to this report.